The following is a list of five prestigious hospitality establishments in Molise, part of the internationalization of tourism firms network. These five establishments offer alternative accommodations aimed at reviving and promoting traditional communities. Immerse yourself in a one-of-a-kind experience rooted in local history. This form of hospitality is based on the Italian “Albergho Diffuso” concept, where rooms are distributed in various—though close-by— buildings and guests come into regular contact with residents. Located in Termoli’s old town, this albergo diffuso is distributed in several buildings and provides hotel services. It is named after the Hohenstaufen dynasty (“Svevia” in Italian), under whose rule Termoli experienced a golden age. The presence of the dynasty was forever sealed when, in the 13th c., Frederick II ordered the city’s castle to be renovated and fortified. The castle is now the symbol and timeless icon of the City of Termoli. Thanks to the albergo diffuso concept, guests can live like locals and amble through the village streets as if they were the halls of their hotel. Residenza Sveva is in a great location, a step away from the beach and the loading dock where ferries depart for the Tremiti Islands. Designed according to an innovative philosophy, Domus Hotel is perfect for all occasions: for year-round vacations, for retreats to relax and unwind, and for travelers on business who’ll find the right ambience and conference rooms that are equipped with the most advanced technology at their disposal. All of our rooms are designed for quiet and face breathtaking panoramic views, and each is named after a flower that is reproduced in majolica outside the room and depicted in a painting inside the room, where you’ll also find an in-depth description of the symbolic significance of the flower and its history. Thanks to the Domus Medica, a fully functioning spa built for bio-integrated therapy, which is managed by experts in the field, our guests have the chance to inject their vacation with a healthy treatment for prevention and cures that utilizes innovative natural therapies and personalized treatment plans, so that you can quickly get back to feeling healthy and in shape. At the foothills of the Matese mountain range, just off the state highway, you’ll find a treelined avenue leading to an historic residence made entirely of stone. Erected at the end of the 1700s, the edifice resembles a miniature village, a row of stone houses (Piana dei Mulini) that is an example of “popular”—yet harmonious—architecture. Despite being built in different time periods, the row-style homes tucked into the surrounding landscape look perfectly grouped. We are located in the river valley of the Biferno, which initially fueled a waterwheel and a center for wool dying. Later, the old mill became an important hydro-electric plant that powered every town in Piana until the 1970s, when energy resources were nationalized and the mill was abandoned. What remained was later renovated as part of a project that sought to preserve and promote the territory’s cultural, historical, architectural and natural heritage, restoring the place to how it was in its heyday. At the same time, the Residenza d’Epoca was born. The warm, inviting rooms at this albergo diffuso are furnished with folk art, and all amenities are provided. 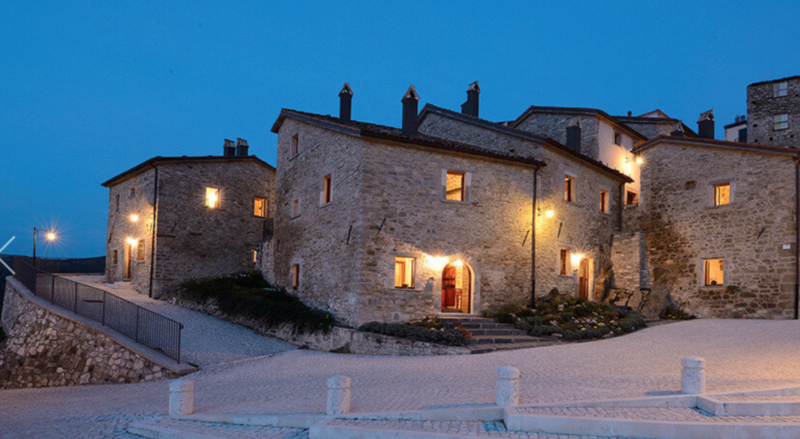 This old country village in the commune di Castel del Giudice, in Isernia, was restored and converted into an albergo diffuso. The meticulous restoration of the place was made possible thanks to the establishment of a public company that involved local citizens, local institutions, and a group of entrepreneurs originally from the area. 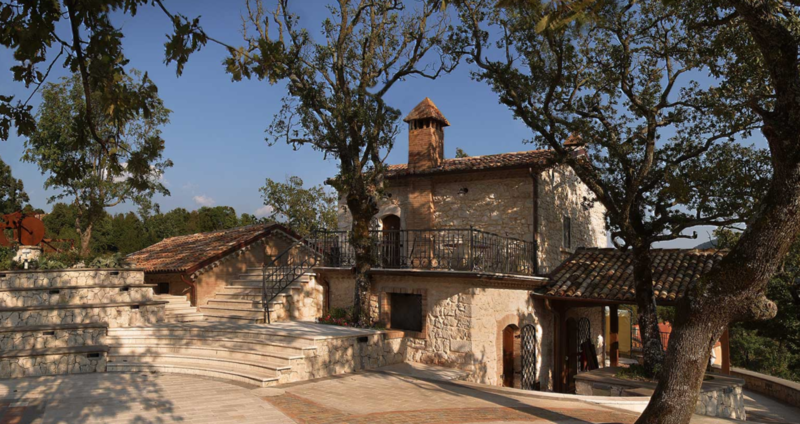 The old village, restored to meet seismic code regulations, has seen the addition of contemporary architecture made with local stone and original materials. The 100-acre organic apple orchard supports the village with a natural and sustainable economy. The place represents a unanimous declaration of local love for the territory’s primitive beauty and natural, historical, and eno-gastronomic import. Eco-sustainability finds a home in Borgotufi, which was officially recognized as one of the most virtuous districts in the nation. Its sober and simple interior design reflects the style and tradition of its residents, without sacrificing any creature comforts.